What if you could do twice what you’re doing now, in half the time, with twice the fun? Sound too good to be true? It's not about change. It's about the transformation. Transformation, not change, can be the greatest challenge with most of our thinking. We want change, but we keep coming up with reasons why it won't work for us rather than reasons why it will. The L.I.F.E. program is all about learning how you think, how to look at the same differently, and experiencing in your life what you once thought was only a dream. If it sounds too easy, consider this: Have you ever not seen something that was right in front of you, and later wondered, “how did I miss that?” Like the old adage about the forest and the trees, we can easily miss what’s relevant and important, completely due to how we think, our current expectations and our attitudes. 95% of the world’s population thinks this way, whereas only a handful actually understand the mechanics of how they think. This motivational seminar will help you begin the journey of a lifetime. 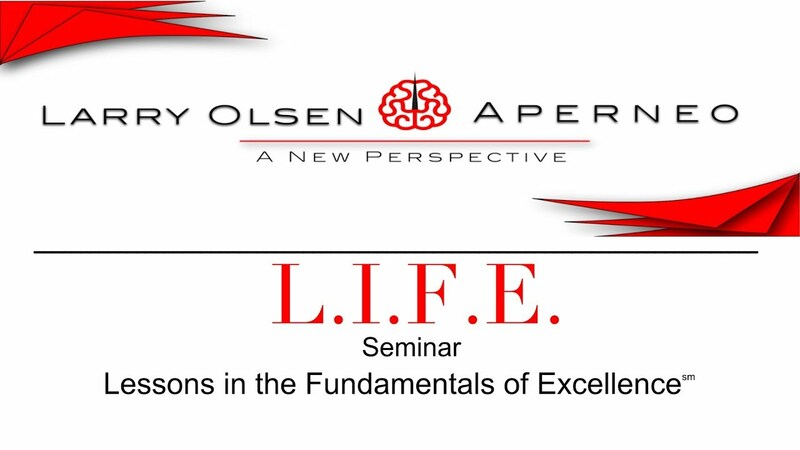 Individuals and business alike benefit from inspirational speaker Larry Olsen’s L.I.F.E. Seminar. The ability to change our opportunities, to change our lives, and to achieve what we never dared to dream possible already lies within reach. It’s simply a matter of understanding how we think. How does the mind function? What subconscious processes are at work? Why are we strongly compelled to achieve some things, and yet others remain firmly beyond our grasp? The answer lies in the science of how the mind works; in our perspective, our approach, and to everything we encounter. As humans, we are amazing collectors of information. When we seek a new direction or pursue a new conquest, dormant attitudes within each of us become active and determine how quickly, or when, we will succeed. If we don’t alter our way of thinking, we may miss opportunities. During this seminar, you will learn how changing our attitudes to align with our visions can result in exponential growth and life success. Be inspired and motivated to reach your true potential through self-empowerment. Open yourself up to better communication and more joy with your family, friends, and colleagues. Empower yourself to move forward in your career, enhance your opportunity for promotion while improving your financial circumstances.